Enjoy fun and action in the largest trampoline arena in southern Westphalia! There’s plenty of room to let loose here in an area of over 2,000 m². Try out the Air Bag and other jumps from a height of around 3 metres, look for a sporting challenge in the Ninja course, or test how high you can jump on the Main Court. With more than 50 trampolines, American Gladiator, B-Bounce facility, Dodge Ball and a pit filled with paper snippets, there’s real fun to be had for all. ATTENTION: changed opening hours on the Christmas holidays !!! 2,5 hours Birthday Table - of which 60 Min Jump Time - from 6 children 24,00 € per child - 4 non-jumping supervisors have free entrance For the use of trampolines a minimum age of 7 years is recommended. 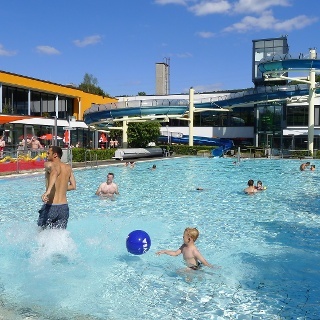 From the Netphen Rathaus bus stop, you reach the N-FLOW leisure park via the L162, bus stop Netphen Waldenburger Straße. From there, the N-FLOW leisure pool is a 100 m walk away. Visitors from Siegen can alight at Siegen ZOB central bus station and take the R16 route to Netphen Rathaus and change there. Netphen is accessible from the A 45 via the Wilnsdorf or Siegen connecting roads. From the A 4 and after the Olpe-Süd motorway junction, there is a connection via the B 54 to Siegen. From there, follow the B 62 to Netphen via Dreis-Tiefenbach. At the roundabout at the entrance to the town, take the first exit and follow the L 729 ring road. Then follow the signs towards Netphen Freizeitpark. Car park no. 2 of the N-FLOW leisure park has sufficient free parking spaces available.